KONDO KAGAKU CO. LTD. announced KHR-3HV, a new model will be put on the market in August 2009． The presentation was carried out at the 5th KHR Anniversary in ASAKUSA ROX3 (Tokyo) on June 13th 2009. KONDO is the leading company of hobby robot and the new robot is the third product of KONDO. 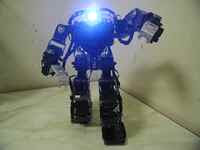 The first hobby robot, KHR-1 was developed by KONDO and put on the market in June 2004. The second one, KHR-2HV was put on the market in June 2006. 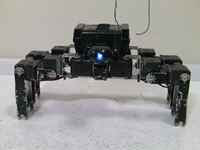 RCB-3HV, the control board developed for KHR-2HV, has been popular among robot builder in Japan. The shipment scheduled in August 2009 from KONDO or other robot shops. Some parts of KHR-3HV including the control board, RCB-4HV will be also put on the market same schedule. 1) Using a high torque servo, KRS-2552HV (14 kg/cm) which was newly developed for KHR-3HV using serial control system. The torque is 1.4 fold of `KRS-788HV used in KHR-2HV makes the robot jump as you see in the presentation video. 2) The axis, number of using servo motor including head, is 17 ( head 1, arm 6, foot 10 ). User of the KHR-3HV could power up the robot easily by exchanging the empty servo case attached the body to the real servo, KRS-2552HV. User could add 5 servos for 2 leg rolling axis, 1 body rolling axis and 2 arm rolling axis. 3) The control board, RCB-4HV was newly developed for KHR-3HV, could regulate the serial connected servo motors. Therefore, the wiring is very simple. 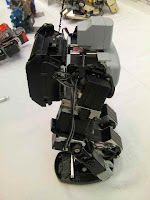 The detail of KHR-3HV was described in KONDO KHR-3HV Site and Robot Watch. KONDO also announced on Nov. 21, 2011 that the English version of the assembly manual for KHR-3HV was available. So, what is your thoughts on this new kit? Do you like it? Do you prefer the KHR-2HV? Do you think they should have done something differently? Personally, I think it looks good. However, I feel like hobby robots need more sensors, including a camera, and computer vision software. Because right now, the level of autonomy is quite low. After that is taken care of I would also like to see more autonomy. But before fancy things like a camera, there needs to be the very basic of sensors (like reporting servo position and current draw) which is missing from most of the robots. This is again because most servos are not really made for robot use. Hm, yeah I agree. At least these servos finally use serial communication. I have seen that Hina design and I agree it is well done. However, I noticed the shoes need a large balancer. As for cameras, they should be quite cheap since there are so many cellphones these days with cameras. I think a company like Vstone could probably market a camera and vision software though, since they have participated in RoboCup with Team Osaka. I don't understand why they don't try to sell something like that? Alex and Hideki, thank you for your comment. I think KHR-3HV is really the 3rd generation hobby robot. I am especially interested in its controller RCB-4HV. RCB-3HV using in KHR-2HV is the most popular control board for original robot in Japan. As RCB-3HV has only 3 analog terminals for sensor control, and almost builder uses two for gyro sensor and the last one for acceleration sensor. RCB-3HV is a poor control board for autonomous robot control, so I am using RCB-3HV with MANOI sensor board, HRP100 for my autonomous fight system. It is announced RCB-4HV has 10 analog and 10 digital terminals for sensor control. I would like to get the new control board, RCB-4HV and try to my autonomous fight system. I agree Alex. For hobby robot autonomous control system, we could just use a few sensors as PSD senor or ultrasonic sensor. I also think image sensing is the most important sensor system. 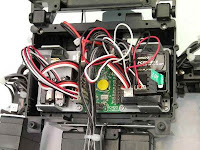 However there is no such compact image sensing system for hobby robot at present. "It is announced RCB-4HV has 10 analog and 10 digital terminals for sensor control. I would like to get the new control board, RCB-4HV and try to my autonomous fight system." 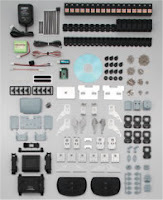 I am interested in getting a kit to make my own robot, too. I was already looking at the Robovie-X from Vstone since it already had 10 analog / 10 digital inputs, as well as LEDs, mp3 audio, etc.. But now that Kondo has made a new KHR, I am wondering if it would be better to get that? I think KHR-3HV is the 3rd generation hobby robot. The control board RCB-3HV attached KHR-2HV, needs another sensor control board as KCB-1 or MANOI sensor board, HRP100 for autonomous control. As you know, the control board of Robovie-X from Vstone, VS-RC003HV also needs sensor control board as VS-IX001 for gyro or acceleration sensors or VS-IX008 for PSD sensor. However, RCB-4HV is including many sensor terminal for autonomous control. My best friend is a geek and he would love this blog, I will tell him about you and this entries. He'll be so happy to read this... I am working, but something I find interesting blogs like this one.